KENAI — Gov. 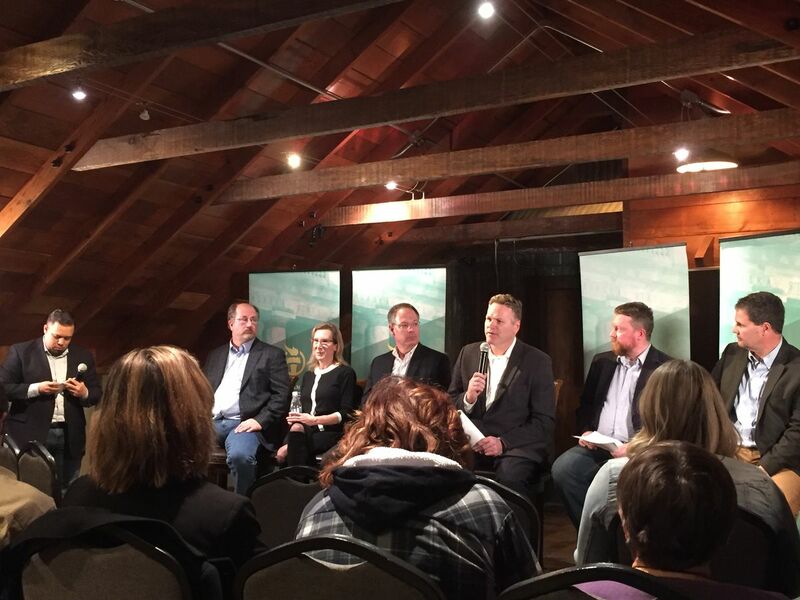 Mike Dunleavy’s roadshow with Americans for Prosperity kicked off in Kenai on Monday night in a crowded attic-like meeting room with exposed rafters at The Cannery, a resort and restaurant near the Kenai River mouth. The crowd of 150 was generally supportive, with several bright red “Make Alaska Great Again” hats in attendance. A small group of protesters carrying signs was kept outside a gate, a quarter-mile from the facility. There was almost no direct interaction between attendees and the governor, who showed up — to applause — in time to take his seat up front, disappeared at the intermission, and left promptly at the end to catch a plane to Anchorage, where a similar session is scheduled for Tuesday evening. Hosting the event was the Americans for Prosperity-Alaska, the local chapter of a national network of anti-tax and anti-regulation advocacy groups funded by the Koch brothers and other conservatives and corporations. The organization’s banners, depicting the Alaska state Capitol, decorated the meeting room. Joining a panel of Dunleavy and several key aides were Jeff Crank, the regional director of AFP based in Colorado, and Larry Barsukoff, operations director for the Alaska Policy Forum in Anchorage. The Alaska Policy Forum is the state chapter of the State Policy Network, a separate 50-state organization similarly funded by the Kochs and Koch allies. The Alaska forum’s executive director is Bethany Marcum, who was an aide to Dunleavy when he was in the state Senate. The first half of the evening, as Dunleavy and state officials presented their budget plans, was emceed by the governor’s deputy chief of staff, Jeremy Price, the former executive director of Americans for Prosperity-Alaska. The second half, in which state officials were joined by Crank and Barsukoff to answer screened questions from the audience, was run by Ryan McKee, the new executive for Americans for Prosperity-Alaska. In an interview, McKee said this week’s presentations had been nearly six weeks in planning, even though, he acknowledged, the recent press release for the events made it sound like the governor’s roadshow was in response to budget hearings being held by the House Finance Committee. McKee declined to say how much of the Alaska operation is funded by the national group, saying that they don’t give out such information. During the question period, McKee read a question asking Dunleavy why he partnered with AFP for the event. “We didn’t want to spend money from the government to go around and do a very expensive roadshow,” Dunleavy replied, drawing applause from the crowd. He added that the roadshow also included other events this week, including closed meetings with resource groups and call-in radio shows. John Rich, one of two national Americans for Prosperity staffers sent to Alaska for the week of events with the governor, said in an interview that one of the group’s main priorities for this year in the state is to push a “Taxpayer Bill of Rights” similar to one in Colorado, which requires voter approval of any new taxes or tax increases. When it came time for questions submitted from the audience, the second question McKee appeared to read off a card went to Crank, the AFP official from Colorado, asking him to explain the Taxpayer Bill of Rights in his state — something that hadn’t been mentioned in the governor’s presentation. The “permanent fiscal plan” presented by the governor aligns well with the anti-tax mission that Americans for Prosperity and allied groups have carried to other states, including Kansas, Wisconsin and North Carolina. But the usual tax-cut message can be confounded in Alaska, which has no broad-based tax, and few taxes at all beyond the oil industry. Dunleavy said an effort to fill Alaska’s current $1.6 billion budget gap with an income tax would impose a tax burden of $2,300 on every man, woman and child in the state, or $5,300 on every working Alaskan. However, his budget chart showed plans to dispense $4,000 per resident this year, which would appear to leave most residents with a net gain even with the income tax. The governor did not address this conundrum Monday night. Maintaining large dividend payouts, under the original dividend statutory formula, is central to his plan, he stressed. The fiscal plan presentation, over the first 75 minutes of the meeting, did not address oil tax credits, which have been a drain on state revenues, at least in the near term. Asked about reducing these credits to the oil industry during the question period, Dunleavy said the tax credit program had already been eliminated, with payments now going for past work. “That program is done, it no longer exists in the form it was.” He did not mention a separate per-barrel tax credit still on the books, which is the subject of debate in Juneau this year. Only one audience question, to budget director Donna Arduin, conveyed some of the anguish expressed in recent legislative hearings over the budget cuts. “Do you have any idea how much your draconian cuts will hurt our state?” McKee read from an index card, going on to describe dire impacts to schools and communities. “Did you get through all that?” Arduin said when the long question was done, eliciting chuckles in the audience. Arduin offered a similar answer to a subsequent question asking for specifics about how a smaller education budget could make education better, stirring the evening’s only murmur of outcry from the audience. She went on to say the governor would be submitting an education plan in the next few weeks. Dunleavy jumped in with a few specifics, saying his administration has been talking with tribes about tribal compacts to develop schools, and new “coding academies” to teach computer skills. Barsukoff, with the Alaska Policy Forum, which has made education reform a priority, mentioned possible cost savings from consolidating administrations in rural school districts.